Oldfield: Mediator Scot Beckenbaugh for NHL MVP? 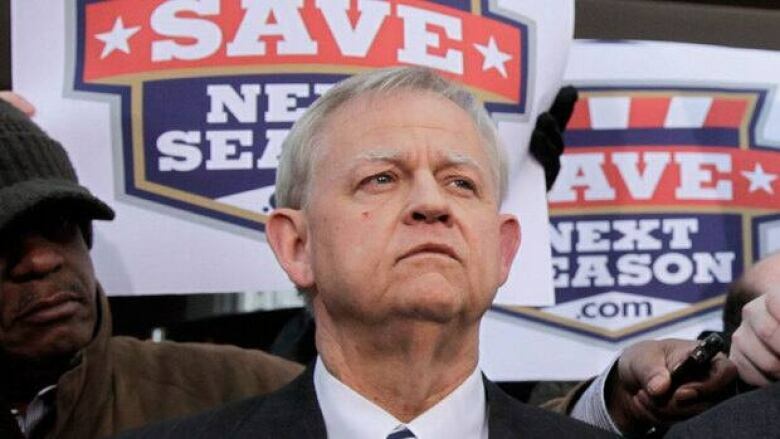 His role was not always understood, but mediator Scot Beckenbaugh played a very valuable part in brokering the agreement that finally ended the NHL lockout, writes labour expert Dan Oldfield. There have already been some observers nominating Scot Beckenbaugh for the NHL’s Hart Trophy, given to the league's most valuable player. The senior mediator is being credited by many as being key to the league and players finally arriving at a tentative collective agreement early Sunday morning. That is quite a turnaround from earlier observations. I don’t know Scot particularly well, having only met him a few times over the years. But I can say a few things. He is regarded as a consummate professional, he knows little about hockey, and the NHL talks were not what started his smoking habit. First, I want to express my thanks for your kind words and the honour of the offer to participate on the show. I am deeply respectful of the media's role and responsibility in high profile disputes. I am also deeply touched and grateful for all the kind words and good wishes expressed by hockey fans everywhere. Especially, of course, from Canada, a country I have been blessed to visit on many occasions and would hope to visit on many more. I do cherish the relationships I have developed with all my Canadian colleagues, the mediators, managers and neutral practitioners at the federal and provincial levels. I regret that I must decline your offer. I do hope you and your colleagues know my declination is not intended to give offence. I am truly honoured and appreciative. However, this is still an "active case" for me and will remain so until an agreement is fully executed and ratified. There are still very important steps to be taken and decisions that must occur. I am optimistic about their outcome but deeply respectful of their serious nature. The ethics of my profession always prohibit the discussion of specifics of any mediation that I conduct. The responsibilities of my position only add to those ethical obligations. Thank you again for your kind words, excellent coverage, and the honour of the offer to participate on the program. Scot would be the first to credit the parties with success at the table. And, in fact, he did that during our short email exchange on Sunday afternoon where I offered him congratulations. He is right to do so. He has performed a role that is not particularly well understood outside the world of industrial relations. There are both participants and observers who repeatedly questioned the involvement of a mediator; some even suggesting efforts to mediate had failed. That view is understandable if you assume that success has to be measured against the outcome of every meeting between the parties. But, as I’ve said before in my columns, negotiations are a process -- not an event. The mediator is often called "the neutral." It’s a designation important to the process because it infers the involvement of someone who is there to advance the bargaining process. Not to judge positions, not to advocate for one side or the other, and not to impose a solution. But to help them find one. And when the deal is done, to stay neutral. The content of the talks belongs to the parties. In our brief exchange, Scot offered no details, nor should he. But as a professional asked to perform a role, he was clearly pleased the parties concluded their deal. In the coming days, I am confident stories will emerge to flesh out Beckenbaugh’s contribution to this effort. We know he’s been engaged for weeks. We know about the many walks back and forth between the NHL head office and the Players’ Association hotel in New York in the final days. We know about the long days (16 hours on the last one). But we don’t know the details of how he pulled the parties back from the brink. You can bet he constantly reminded them how close they were. You can bet he reminded them of what was at stake, what they owed the fans and each other. And you can bet he offered lots and lots of suggestions. But primarily he kept them at the task. When he realized the parties were close to a deal he brought them together and there was no way they were getting out of that room without one. He’d be the last to accept it, but Scot is owed a big thank-you from fans, players, owners and others who make a living from professional hockey. Dan Oldfield is the lead negotiator for the Canadian Media Guild, a former journalist, and a longtime hockey fan.